I got a little carried away with the geometry of the hexagon blocks and lost sight of my original plan to build on a large central star, and just played with the shapes. 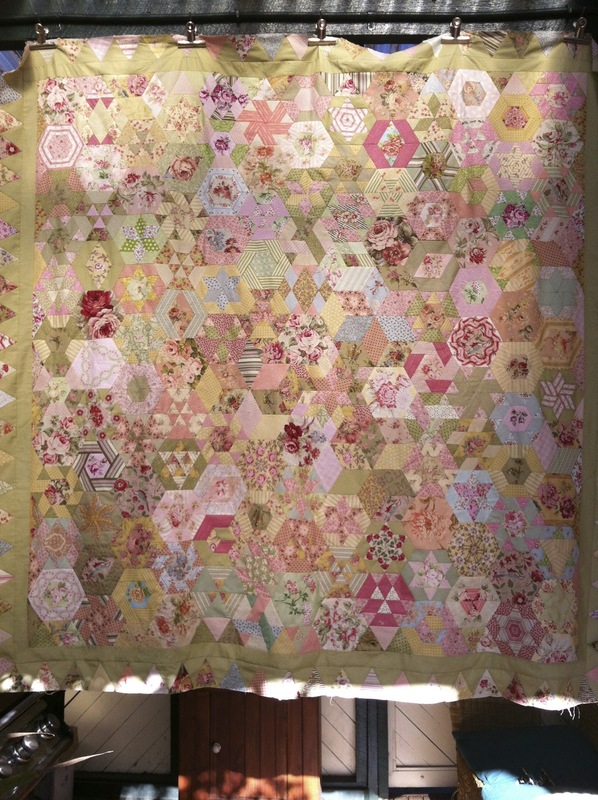 I think i counted over 25 combinations of shapes making up the 3inch hexagons that went into my quilt and found several more once i had called it quits. There was a lot of opportunity for fussy cutting and using directional prints to enhance the block design's. Although i initially wanted to make this using bright fabrics that would work with my left over Kaffe's, the eventual colour scheme was governed by my impatience to begin. 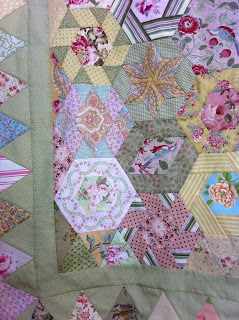 An existing scrap stash of green, pink and lemon fabrics left from a previous quilt was resurrected. Needles to say I added so much extra fabric that i could probably make another. I marked the seam allowance and stitched all the blocks and border strips by hand, point to point, using bottom line thread and a tiny running stitch. The borders were attached by machine as i wasn't sure i could stitch a straight line for 60 inches. I am pretty sure there will be another version of this in my future and i will try and stick closer to Kim's circular medallion version. Detail of bottom left corner, it is really straight. I tried several times throughout the day to get a picture without shadows. I think i need to get up earlier. As usual I am now waiting for inspiration to how to quilt it. Love it, I can see me making another of these quilts as well, I loved all your different hexagons and want to make my next quilt more like yours. I love the softness of your colours Sheila. It must have been a brain tease to complete all these hexies so differently. 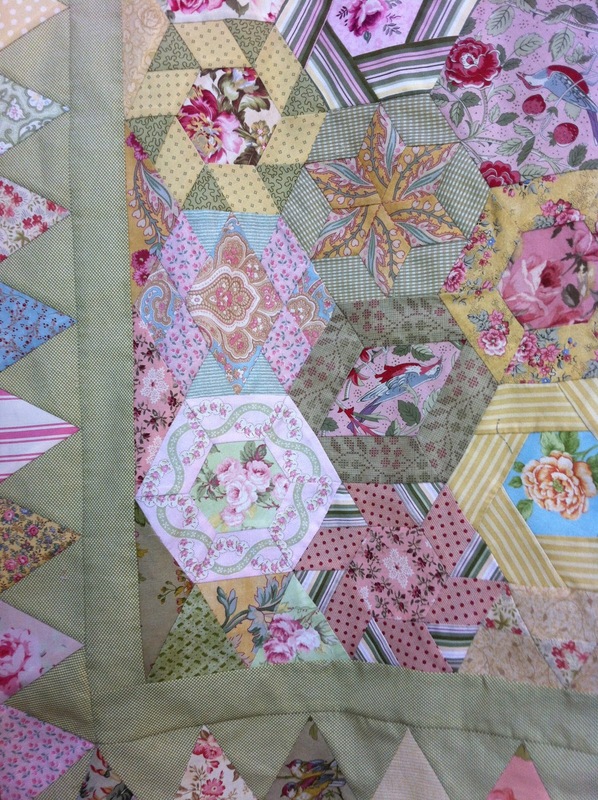 Lovely fussy cutting and Very Clever!